Sumoylation is one of the post-translational modifications commonly seen in proteins. This involves the covalent binding of a peptide called SUMO to specific sites on the proteins made up of lysine amino acids. conjugation: the activated SUMO is bound to the proteins. Four types of SUMO proteins have been described until now. 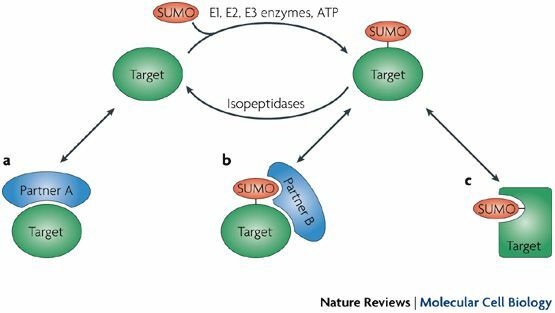 Sumoylation leads to a change in the sumoylated protein: it may enable it to recruit a new partner or change its conformation. Although related to ubiquitination (which leads to degradation of the target protein) in its biochemical process, sumoylation enables very different functions. These include regulation of the cell cycle, stabilisation of the protein, nuclear-cytoplasmic transport, regulation of transcription, etc.